To commemorate the 30th anniversary of The Tutankhamun Exhibition in Dorchester, two specially commissioned replicas of the shabti figures of Tutankhamun are on show for the first time. Two specially commissioned replicas of shabti figures have been put on show for the first time at the Tutankhamun Exhibition in Dorchester to commemorate its 30th anniversary. In ancient Egypt during the period of Tutankhamun, shabtis were placed in tombs to act as the ‘deputy’ of the deceased. The shabtis were created to undertake menial tasks in the next world and were activated by magical texts from The Book of the Dead. 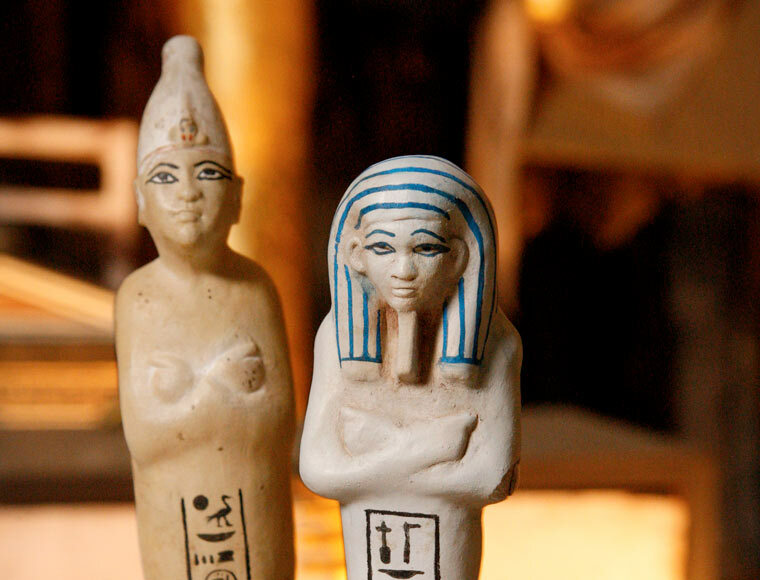 The two shabti figures on display in the Tutankhamun Exhibition were part of 413 found in Tut’s tomb. This is an extraordinary number as the average number of shabtis used for a private burial was two. However, the large number found in the tomb appears to reflect his royal status. The number of Tutankhamun’s shabtis is symbolic. There are 365 worker shabtis representing one for each day of the year, 36 supervisor shabtis, one for each ten day week, and a series of 12 monthly overseers. Only 29 of Tutankhamun’s shabtis were inscribed with the full magical text from The Book of the Dead, most were only inscribed with his name and title. One of the shabtis on display is only one of two depicting Tutankhamun wearing the white crown of Upper Egypt and as such is rare. The other is made in blue faience, one of 286 shabtis wearing the tripartite wig. The Dorchester exhibition is unique in that it displays the very first detailed reconstruction of the tomb of Tutankhamun. Speaking at the exhibition in Dorchester, Michael Ridley, founding director said, “These two beautiful shabtis are personal and poignant relics of the young king Tutankhamun, who died at the age of 19. They are an important addition to the wonderful objects displayed in the exhibition. “During its 30 years the exhibition has been seen globally by more visitors than any other exhibition on Tutankhamun outside of Egypt. “Tutankhamun’s story is fascinating and the treasures of the greatest archaeological discovery of all time are breathtaking, the exhibition’s innovative approach and techniques, enabled a reconstruction of the tomb to be made, as well as recreating the treasures using, wherever possible, the same materials and methods, making the treasures shown in this exhibition as identical as possible to the originals in Egypt. The exhibition is open daily 10am–5pm at 25 High West Street, Dorchester, Dorset DT1 1UW.